When I was home last week, friends asked if I still bake at home since I do that at work everyday. "Of course! I can bake anytime for the people I love." I am sure a lot of people feel the same way too. It doesn't matter if it's an elaborate cake or some simple cookies. Freshly baked goodies make people feel loved and special. Although I have just started work in the hotel for less than a week, I already noticed that colleagues from different departments like to stop by the bakeshop from time to time. Everybody is curious about the goodies we make for the day. If luck is on their sides, they may even get a taste of something fresh out of the oven. It still amazes me sometime to see people's contented smile, when given something as simple as a warm chocolate chips cookies. Which is what I almost baked when I was home, but there's leftover eggwhites from other baking projects that OCT brought to my attention. "Can you use up the eggwhites first before making other recipes?" Almost immediately, some dessert ideas come to mind. 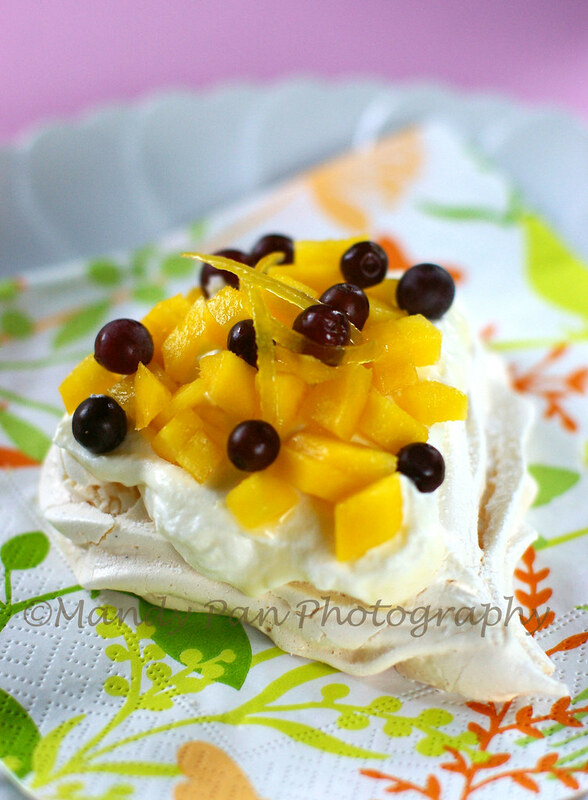 The first one is pavlova. Minimum effort, improportional gratification. Instead of making one big pavlova, I piped the meringue into individual portions. Store in an airtight container, they can be kept for a week under room temperature or up to a month in the freezer. A perfect standby for the unexpected dinner party! 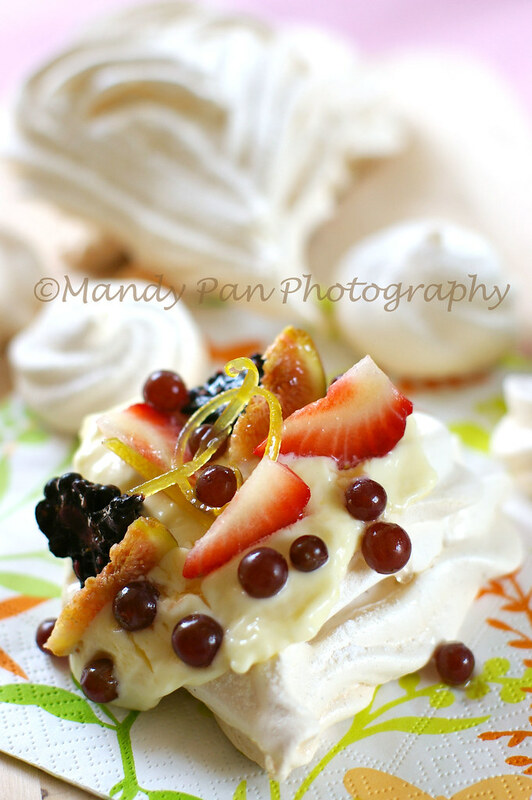 I topped the meringue shells with some whipped cream + homemade lemon cream and fruits we have in the fridge. A few strips of candied citrus zests help to balance the sweetness of the meringue but it's completely optional. A simple and low fat dessert that both OCT and I enjoyed. Next, another simple recipe to use up MORE of the leftover eggwhites(much to OCT relief). Place the egg whites, cream of tartar and salt in the bowl of an electric mixer fitted with a whisk attachment. Beat the egg whites on high speed until firm, about 1 minute. With the mixer still on high, slowly add the sugar and cornstarch, followed by the vanilla extract and beat until it makes firm, shiny peaks, about 2 minutes. Fill the meringue into a piping bag with star tip. Pipe the meringue onto the parchment paper. Bake for 40-50 minutes or until the outer side feel dry and hard when touched. Turn off the oven, keep the door ajar, and allow the meringue to cool completely in the oven, about 1 hour. It will be crisp on the outside and soft on the inside. 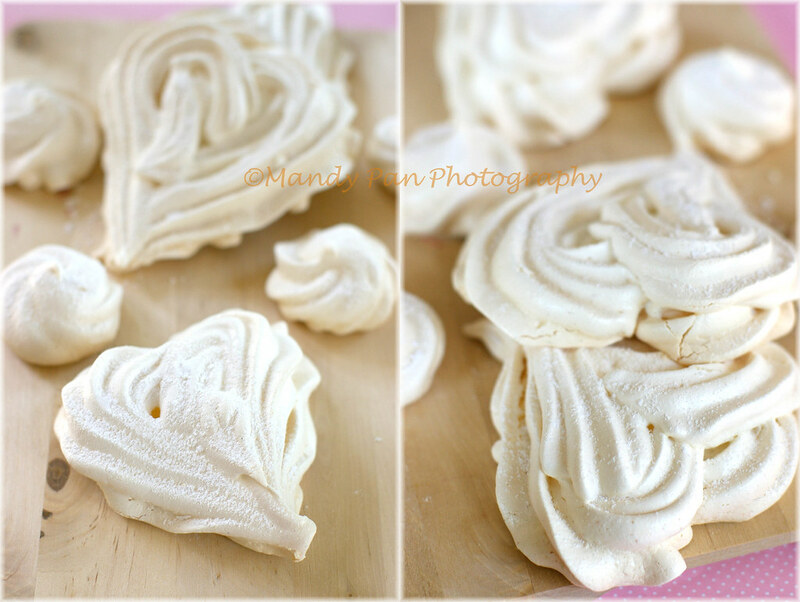 Remove the meringue disks from the parchment paper when they are completely cool. If not consumed immediately, keep them in airtight containers. They can be stored at room temperature for a week or freeze for a month. When ready to serve, top meringue shells with sweetened whipped cream. Note that the recipe below is just a guide. I usually just whip some heavy cream in a bowl to soft peak, combined with vanilla extract and fold in some lemon cream. Taste to adjust. Whip the cream in the bowl of an electric mixer fitted with a whisk attachment (you can also use a hand mixer). When it starts to thicken, add the sugar and vanilla and continue to beat until firm. Don't overbeat! Fold in the lemon cream. 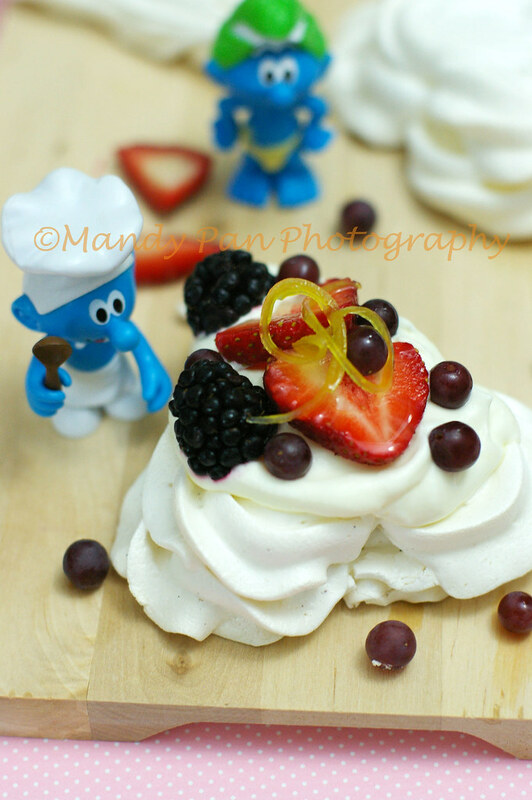 Pile your choosen fruits onto the cream. Enjoy! As my friend J aptly pointed out, this has been the longest break ever on my blog. I didn't realize that some of you still take a peep into this space from time to time to check on me! Truth is, the past month was nothing short of a roller coaster ride. From the despair of inevitable unemployment to the various empty promises, I was all ready to pack my stuffs and head back to Atlanta. Who would have thought that the last interview I had in less than a week before my scheduled departure would land me a job on the very same day? It feels so surreal and call me superstitious, I try to keep it really quiet before I sign the contract. No job status updates on Facebook, because that has been "established" to jinx whatever good things coming my way. The first thing I did after signing the contract, was to buy a plane ticket to Atlanta. A much needed break before the commencement of a new career; some quality time with OCT and baking in my long neglected kitchen are in order. No fancy, multi steps recipes that take days to complete. I have set out to use the seasonal fruits to bake something for my friends and loved ones. 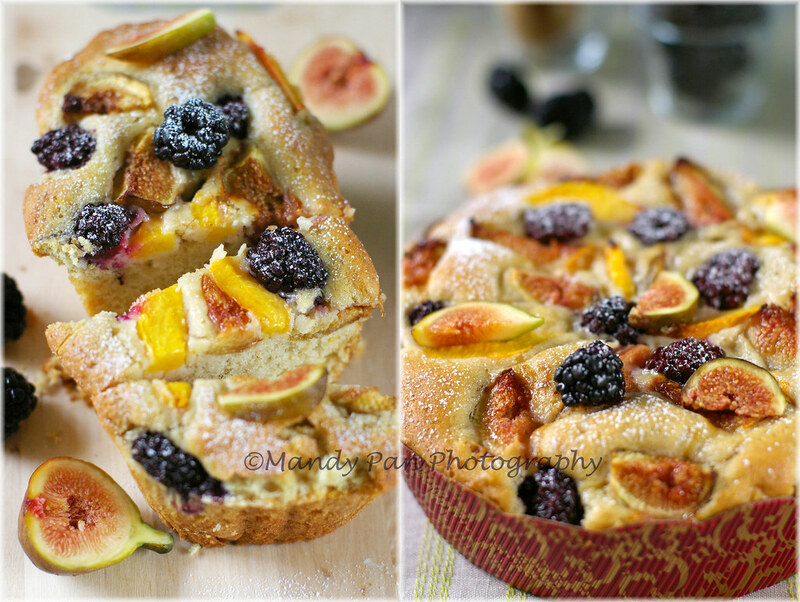 This easy fig and blackberry coffee cake simply fit the bill! 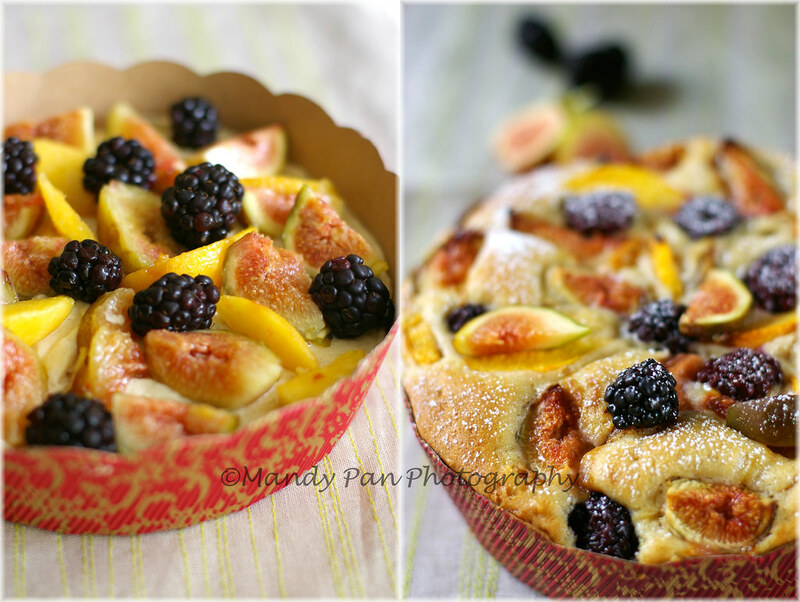 I have combined some sierra figs that a friend passed us, together with some blackberries and peach in the batter. The inspiration comes from Zoe's cake, which is an adaption from Dorie Greenspan's blueberry crumb cake. It's a lovely cake to be eaten with a scoop of ice cream or a cup of tea in the afternoon. I bake the cake as a gift for OCT's colleague and a smaller one to nibble in the afternoon. Note that the cake rises significantly, so you don't want to fill the cake pan too full. If using a smaller pan or a taller pan, you can add some thinly sliced fruits in between the batter for extra moisture. Although it's not absolutely necessary, I find that resting the cake overnight allow the flavor and moisture to redistribute itself. The cake tastes much better the next day. Preheat the oven to 350F and lightly oil an 8-inch square pan. Combine the all purpose flour, baking powder, baking soda, ground cinnamon and nutmeg, sift into a big bowl or onto a piece of parchment paper. Beat the room temperature butter with sugar, vanilla extract and lemon zest until light and fluffy. Add the eggs one at a time; make sure that the first one is well incorporated before adding the second. Scrape the bowl to make sure all ingredients are well mixed. Add in 1/3 of the flour mixture, followed by 1/2 of the milk + yogurt mixture. Alternate the addition of dry and wet ingredients, mix until just combined. Overmix will lead to a tough cake. Pour the thick batter into prepared pan and arrange fruits in a decorative pattern on top. Bake for 50-60 minutes, or until a skewer comes out clean in the center.